Mental Health First Aid at Work is a skills-based and experiential corporate training program that teaches employees how to notice and support an individual who may be experiencing a mental health or substance use concern or crisis and connect them with appropriate resources. Mental Health First Aid at Work is an evidence-based practice. 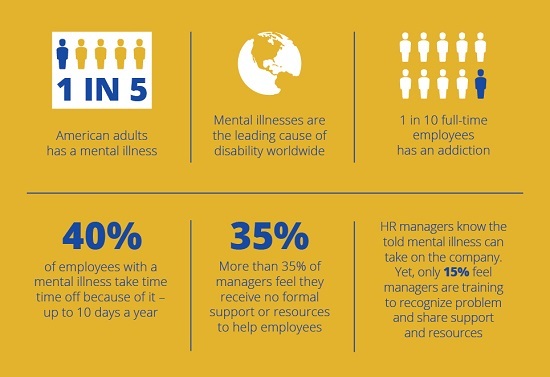 Why Should Employers Care About Mental Health? Mental Health First Aid at Work is available as either a 4-hour course or 8-hour certification program, depending on the needs of your corporation. Both the 4-hour and 8-hour options teach ALGEE, the 5-step action plan to provide support to someone experiencing a mental health or substance use problem. The Mental Health First Aid at Work training also includes a training needs assessment to incorporate your company culture, policies/procedures and employee resources and into the presentation slides and case studies. Interested? Contact Janine Smalley for more information or to schedule a training at your workplace.